The reboot of The Mummy starring Tom Cruise has received some scathing reviews from critics. The film, which is released in the UK on 9 June, also stars Annabelle Wallis and Russell Crowe. Writing in The Guardian, Peter Bradshaw said: "This has some nice moments but is basically a mess. "The plot sags like an aeon-old decaying limb: a jumble of ideas and scenes from what look like different screenplay drafts." Empire was slightly more kind, with Dan Jolin awarding the film three stars. 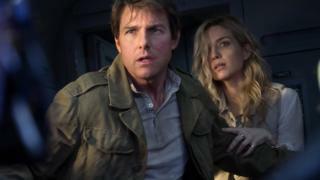 "It's running and jumping grin-flashing business as usual for Cruise, once more on safe character territory as an Ethan Hunt-esque action protagonist who couples up with a much younger woman, while another woman chases after him," he wrote. "And if the next instalment-teasing conclusion is anything to go by, Cruise seemed to have enough fun making this that he may just return for more." Geoffrey Macnab gave the film two stars in his review for The Independent. "The stunts are by far the best element here," he said. Whether it's planes being torn apart, Cruise and Wallis driving through the woods with the Mummy in pursuit or the very spectacular finale, the visual effects are first rate. "Whenever the action stops, though, the film becomes derivative and empty headed." Writing in Rolling Stone, Peter Travers described the film as a "monster fail". "For all the huffing and puffing and digital desperation from overworked computers, this reboot lands onscreen with a resounding thud," he said. "Tom Cruise should have played the Mummy - that way his face would be swathed in bandages and his fans wouldn't have to see him sweat so hard to get this lumbering loser off the ground." Needless to say, he gave the film one star. Owen Gleiberman of Variety said the film was "too busy to be much fun". "The problem at its heart is that the reality of what the movie is - a Tom Cruise vehicle - is at war with the material," he said. The Telegraph's Rebecca Hawkes gave the film three stars but criticised some aspects of the film, writing: "Perhaps the real problem, ultimately, is the characters themselves." She added: "The reason the Marvel shared universe, which took years to build up, works, is because all of its superheroes feel engagingly human: Fully-formed characters we actually want to spend time with. Here, the writing is one-note, and the leads little more than placeholders. "Universal's monster franchise has made it out of the tomb, just about - but if this rebirth is going to sustain itself long term, it's going to need a little more meat under its bandages."